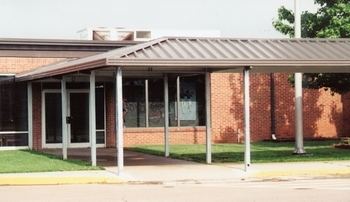 Project: Friendsville Elem. School - Maryville, TN. Childers gable walkway cover is ideal for those projects that require a more sophisticated appearance. With it's standard 4 on 12 double sloped roof and optional hipped ends this is a canopy of distinction. This canopy model can be designed to accommodate special slope requirements when necessary. Furthermore, an assortment of ROOF TRIMS can be added to further enhance the architectural appearance.